For some weeks now I have been seeking Gods wisdom in the area of hope. Many years ago, I was at a party and a friend asked a question, “what makes you get out of bed everyday?”, I was quick to give an answer, “my mortgage of course, I have to work to pay my bills”. Thank God for growth, I now have the correct answer, I get our of my bed each day with gratitude to God for one reason, hope. Hope for the exhibition of God’s promises in my life, to see His good thoughts towards me manifest, hope of seeing Jesus face to face someday, the list goes on. Hope is the oil in every human life, it is the force that keep us moving forward. One thing that can deflate hope is bad thoughts. What we think matters. Thoughts are formed in the mind through many channels, and majority are linked to our human senses. What we think about ourselves help shape our lives. The power of reasoning is one of the virtues God gave to mankind. Everyone has the capacity to engage with the invisible, a world of unspoken words, deep thoughts and discuss; all in the mind. It is time to be at alert, guard our minds against the exaggerated negative news of today’s media. Don’t forget every news is driven by its market monetary value, first. We must be careful not to fall prey to the deceit of ungodly people, the rumors and lies stemming out from the kingdom of darkness to make our hearts go cold. 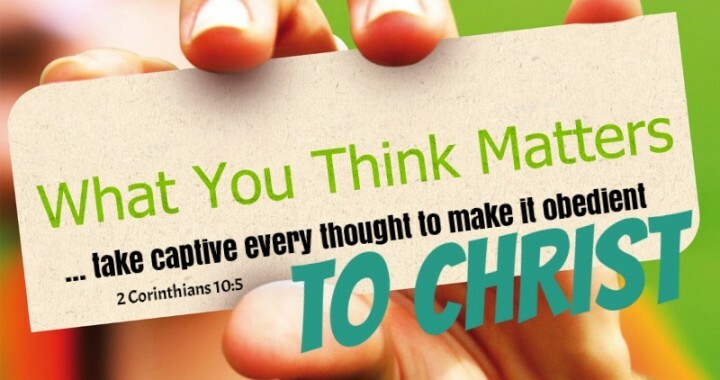 We must not stand for this, but take captive every evil thought and make it obedient to Christ. You have a job to do. You must be quick to recognise and cancel every negative word spoken over you and over every believer. Be alert and ready to respond to the scheme of the evil one who comes to steal, kill and destroy. We have sovereignty over what we allow our minds to engage with. Watch out for the songs you sing, the video you watch and the friends you keep. As we go into the month of October have a review and take captive every evil pronouncement and thoughts; MAKE THEM obedient to Christ. Father, thank you for I know who I am. I am walking in the power of your word. I am obedient and so I take captive every word of failure, rejection and dishonor that has ravaged my mind for so long. Today, I am free! I think only of what is true, noble, just, pure, lovely, good, virtue and praise worthy in Jesus name. Amen. Posted in Foot Lamp and tagged God, Meditate, Obedience, Prayer, Think.